Meena Kumari like Madhubala died at a relatively young age having lived a life filled with heartache, misery, depression and intoxication.. The actresses belonging to the Black and white era, had the kind of magic, that none of the present day actresses can hope to achieve in all their life time. They were all naturally beautiful, talented and had such an aura , that they left you spellbound with their screen presence. When I am in the mood to watch a Hindi film, I automatically decide on an old black and white classic, no matter how many times I have already seen it before. Some of my favourite actresses were Madhubala, who, is considered to be the most beautiful actress ever to have graced the Indian screen. 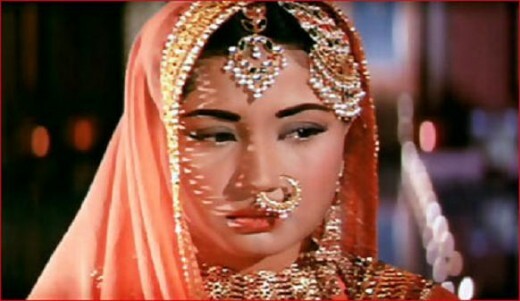 Nargis, another great actress who acted in some of the most loved classics of the fifties, Meena Kumari, who in my opinion was/is the most talented actress ever. 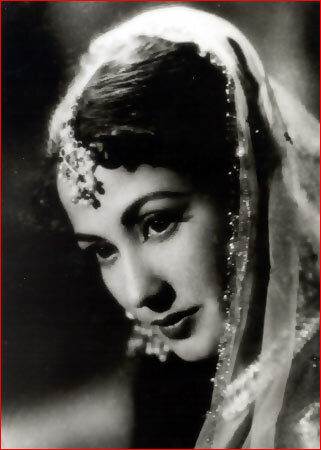 Waheeda Rehman, an absolutely delightful and one of the most graceful actress with a perfectly chiselled profile, Geeta Bali, with her impish looks, was a joy to watch on screen, and the Statuesque and the arrogantly beautiful Vyjayantimala..
Amongst all the actresses other than the Magical Madhubala, Meena Kumari was the most talented and mesmeric actress ever. I personally feel that she has no match to this day. Although she was a Muslim in real life, most of her on screen roles were that of a typical Indian woman dressed in a traditional Saree with the pallu ( saree end) covering her head, the large red bindi on her forehead, and, understanding and affection enveloping all those she looked upon. The two Muslim socials where she made a tremendous impact were ‘Bahu Begum ‘and ‘Pakeezah’. One can go on about her performances – She had many great films and performances to her credit. She was an alcoholic, extremely unhappy during the last years of her life suffering from Liver cirrhosis . The only bright spot came towards the end when she acted in what was probably her career best film Pakeezah which took 14 long years to make after, she fell out with Kamal Amrohi, her husband, who was incidentally the Producer and director of the film. She was second wife to Kamal Amrohi , the talented Director. But the marriage saw many ups and downs and finally they separated , only to come together after nearly 12 years to film the immortal Pakeezah. Meena Kumari, after seeing a few reels of the film that was shot, was convinced that it was going to be a tremendous film, and she convinced some of their commonn friends to talk to Kamal Amrohi to revive the shooting. She was suffering from her illness and knew that her end was near…The film was released to a luke warm reception .